Nutrition and wellness discussions more often than not are directed at the adult population; however, healthy habits need to start with children. Many health problems such as diabetes and heart disease can be prevented or minimized if society prioritizes healthy living starting in childhood. If young people understand why nutrition is important and why certain foods are healthy, they will feel more empowered to take steps towards a healthier lifestyle. Wellness also warrants attention to mental and physical strength. Most people forget about the importance of mental wellness, especially today with all the electronic distractions and constant stimulus from the Internet. Kids need to learn how to disconnect from these interferences and how to de-stress in healthy ways. Through meditative and centering practices like yoga, they can learn how to be physically active while also improving their mental wellness, which is beneficial for kids in stressful environments. In fact, many studies have demonstrated the benefits of yoga and mindfulness in school aged children. I believe it is critical to educate young students about nutrition and wellness along with other core courses in the school curriculum. Through personal experience I have learned that kids typically do not want to try new things unless they know why they are doing it or how it benefits them. Kids are also much more likely to listen to their peers and are eager to find mentors with whom they can identify. With this in mind, I really wanted to create a program that empowers kids to be healthy – as knowledge is power. Ultimately, my goal was to educate them about wellness and the benefits of nutrition, mindfulness, and yoga. Thus, I created a nonprofit called Piece of Peace where students educate and empower other students about nutrition, mindfulness, and yoga. I created a curriculum of nine fun PowerPoint lectures covering important fundamental nutrition topics such as how to understand new nutrition labels, how to incorporate proteins into your daily diet, and why vegetables contribute to good health. The curriculum also teaches kids how to do simple yoga poses that aid in digestion and promote mental and physical strength. To complement the curriculum, Piece of Peace has many colorful and engaging posters that reinforce each nutrition lecture and teach the benefits of mindfulness. Yoga cards were created to show kids how to do each yoga pose and describe the nutritional and physical benefits of the practice. I am currently working to introduce Piece of Peace into the Palm Beach School System so that it can be available to all kids. 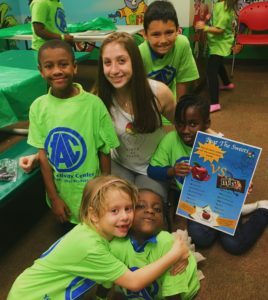 This program is effective not just because it appeals to kids, but it is brief and impactful, teaching kids the foundation of what they need to know to be able to live in a healthy manner. In life, kids will need to make healthy choices. We cannot always control what food is being served or what stressors lie ahead, but we can empower kids with knowledge so they can use this information and make the best and healthiest decisions. While creating this program, I have realized many things. First, kids crave information! I thought initially that it would be hard to keep their attention during the 20 minute PowerPoint presentations. I was wrong! The kids identify with the many pictures on the slides and they discover the mindfulness component of eating as they can smell, touch, see, and taste the food. At the end of the lectures, they are so proud and excited to answer questions with the information they just learned. They also feel successful during the yoga portion of the program as everyone can do the poses. Piece of Peace is demonstrating that kids love to learn from other kids and want to be healthy both mentally and physically. As Piece of Peace continues to grow, new components are being added to help educate even more kids. One such component is a website that makes Piece of Peace’s educational materials, including the PowerPoint nutrition lectures, posters, and yoga cards, available to all. I am also developing a phone app where kids can learn more wellness-related tips. 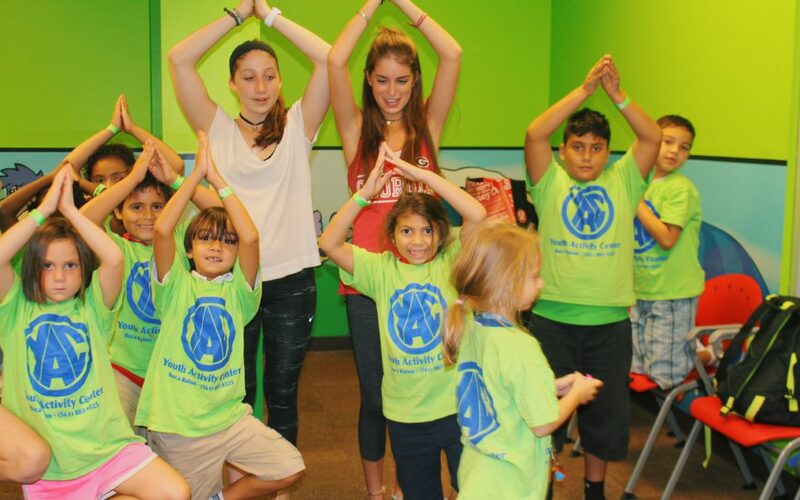 Through my program, I hope to make learning fun and improve the health and wellness of kids. Kids are eager to become educated and I have witnessed firsthand how quickly and energetically they soak in the information. This knowledge is powerful and can improve their physical and mental wellness, allowing for a better quality of life! Jackie Brenner is a senior attending Phillips Exeter Academy in New Hampshire, but calls Boca Raton, Florida home. She has been a vegan for several years and is constantly adjusting her eating habits and exercise regimen to maximize her health and well-being. Jackie knows the demands of school aged children/teens, and understands how it is hard to find healthy, quick, and nutritious snacks. She has completed several vegan-cooking classes, worked in a restaurant as a chef, shadowed nutritionists, and reads constantly about Ayurveda and yoga. Jackie is the founder and president of Piece of Peace Corporation (non-profit), founded in December 2016, and has been working to improve and expand on the program since then.